Each year on June 24 (the winter solstice in the Southern Hemisphere) Cusco celebrates the Inca Festival of the Sun – Inti Raymi. Created by Inca Pachacutec, Inti Raymi was a tribute to the venerated Sun God Inti. Nowadays, the festival draws thousands of local and international visitors to the ancient Inca capital – Cusco – to celebrate one of the most important events of the calendar year. During Inca times, approximately 25,000 people would gather in Cusco to celebrate the festival of Inti Raymi. The Sapa Inca, nobles, priests and headmen of the Inca Empire would gather in Haukaypata to a witness a parade of cloth wrapped ancestral mummies that were brought from nearby temples and shrines. As many as 200 hundred llamas would be sacrificed during the festivities and the Haukaypata ran with sacred blood and plentiful chicha (the Inca beer). The festivities took place from dawn to dusk. There were special dances and coca leaves were read and burnt in great quantities. Inti Raymi was the greatest Inca festival of the year and everyone who attended became drunk with spiritual communion. 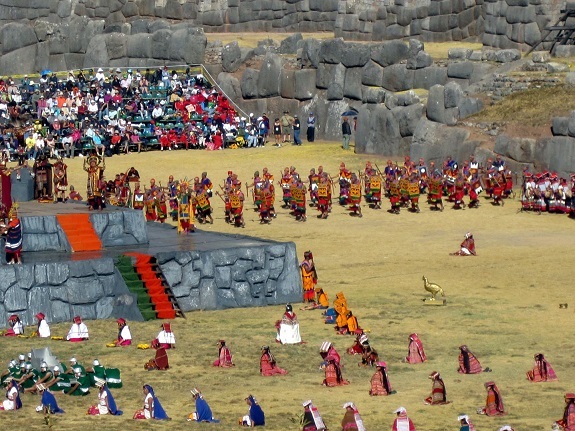 The modern day re-enactment of Inti Raymi still retains all of its majestic glory, albeit without the procession of ancient mummies and just 1 animal sacrifice at the culmination of the day’s celebrations. The celebrations start in the morning on the large open cancha at the front of the Inca Temple of the Sun – Korikancha. 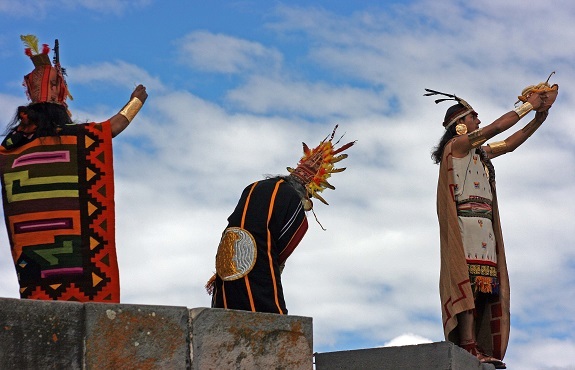 With the arrival of representatives from the four suyos of the Inca Empire (Qollasuyu, Kuntisuyu, Antisuyu y Chinchaysuyu), the Sapa Inca opens the festivities with invoking praise to the sun god – Inti. From Korokancha the royal entourage continues the short distance to Cusco’s Plaza de Armas. A ceremonial reading of the sacred coca leaf then takes place to foresee the fate of the Inca Empire for the up-coming year. The ancient Inca archaeological site of Saqsayhuman is where the final part of the re-enactment is played out. Thousands of local spectators crowed the surrounding hills for a glimpse of the ceremony, whilst premium grandstand seats are available in the main arena of Saqsayhuman. Dressed in full costume, the Inca delivers his final words in Quechua before a ritual sacrifice of a llama. The festival finishes as the air fills with the sound of horns, panpipes and beating drums. There is no official seating for viewing the festivities at Korikancha, only public standing room. The festivities take place in the gardens outside of Korikancha which is located along one of Cusco’s principle roads – Avenida El Sol. Locals arrive early (early hours of the morning) to the best viewing spots. Nearly all of Plaza de Armas is cordoned off for the festivities, with just space in the colonial arcades around the outside of the plaza available for public viewing. Due to the limited viewing areas in the plaza, on looking spectators can often form crowds of 4 or 5 people deep to catch a glimpse of the action. The best vantage points are found on second floor balconies in the many bars, cafes and restaurants surrounding the plaza. If you plan to view Inti Raymi from a balcony, make sure that you contact the bar owner a few days before to guarantee your spot. Many local Peruvians who cannot afford the high prices of the grandstand seating within the grounds of Saqsayhuman choose to watch Inti Raymi from two hills that overlook the festivities. One is located within the park of Saqsayhuman and the other is adjacent just outside the park perimeter. Although the main ruins of Saqsayhuman are closed to visitors during the day of Inti Raymi, general entrance to the surrounding hills (within the park) are free to all foreign and local visitors. Be warned that both hills get very crowed from early in the morning, many hours before the festivities take place. Go prepared with something to sit on, plenty of food, liquid refreshment and sun protection. Arrive at as early as 8am to get the best viewing spots. 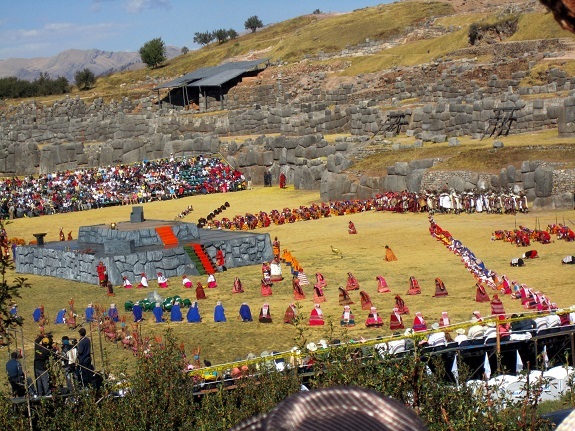 Grandstand seating within the arena of Saqsayhuman is the best option to watch Inti Raymi. These seats are premium seats and are sold on a first come first served basis. There are two price bands for Inti Raymi Tickets: Orange and Blue seating (the best) which costs US$ 140 per adult* and the slightly cheaper Green seating which costs US$ 100 per adult*, a 50 % reduction applies for children under 12 years old. For the best and most informative experience it is always best to go with a guided or as part of an organised tour group. *Prices are based on 2014 published rates. On June 24, the entire centre of Cusco is closed to regular traffic including local buses and taxis. Only approved tourist vehicles are allowed to transport tourists from Cusco to Saqsayhuman. If you are attending Saqsayhuman independently, then you can expect to walk to Saqsayhuman from Cusco, which takes approximately 1 hour with the increased crowds and street vendors you’ll encounter along the way. Streets that are closed include: Avenida el Sol, Plaza de Armas, Calle Plateros, Calle Sapi and Calle Don Bosco (the road that leads from Cusco to Saqsayhuman). Other peripheral approach roads to the centre may also be closed. 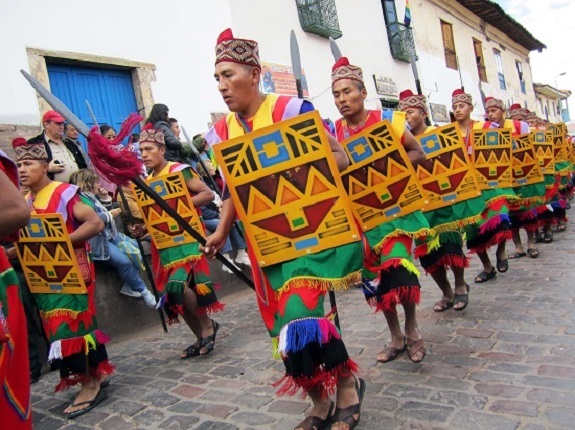 Peru is also home to several other festivals such as Fiesta de la Candelaria in Puno, Festival Internacional de la Vendimia held in Ica and Fiesta de la Virgen del Carmen held just outside Cusco. If you’re interested in experiencing a few different elements of Peruvian culture rather than simply seeing Lima and Cusco, we recommend you take a bus rather than flying straight. There are some fascinating, unexplored destinations that you can visit to experience authentic Peruvian culture. For this, we strongly suggest taking Peru Hop‘s route along the coast. This route also ascends gradually which will give you some important time to acclimatise to the thinner air and help prevent altitude sickness in Cusco. For the majority of travellers, especially those who take time to acclimatize, the effects of altitude will be limited to some shortness of breath and a mild headache. However, should any of these conditions become worse or fail to diminish after a few hours, it can be a very serious even life threatening issue, and should not be treated lightly. Some additional planning should be made to ensure you protect your health.